Golden Goals might have a football theme as well, and there is no denying that if you look at its special feature sections, but for the most part the reels will be occupied by classic fruit icons. The game is interesting in more ways than one, and quite unusual thanks to the features which are not the standard ones that most slots will use. It was designed by Microsoft, and by the looks of it you will enjoy it if you’re searching for something that plays in a different way. Despite the classic inspiration, you will discover 5 reels & 20 bet lines in Golden Goals. The slot’s features include scatters, wilds, free spins and various trail based bonuses. The slot’s top payout gives you $10,000. 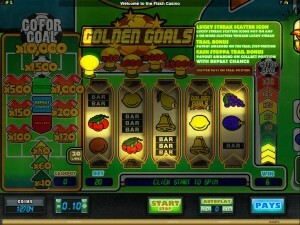 The features offered in Golden Goals are anything but normal. You will find inside things like a scatter icon, bonus games, a Trail bonus and the Cash Stoppa Trail. This part of the game requires that scatter icons have to appear on the reels, a minimum of three times, before you can get access to it. You’re going to be taken to a new screen, where you will be offered free spins with guaranteed wins in them. Every single spin you get will be a winner, and if not it will keep happening until it is. This part of the game is the only one to have wild symbols in it. These wilds are used as substitutes and as a way to trigger some very impressive top prizes. As a wild, it will replace normal symbols, so scatters are not influenced by its presence. As a symbol that is forming combinations, it will pay between 10x and 10,000x, for two to five of them arranged on a payline. You use a fixed number of coins, which is at 20, one per line. The line bet is the one you work with, taking it as high as $1. What you get this way is a $20 maximum bet. 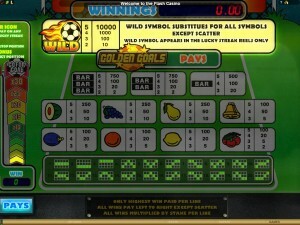 In exchange for that $1 line bet, the slot offers payouts of up to $10,000. 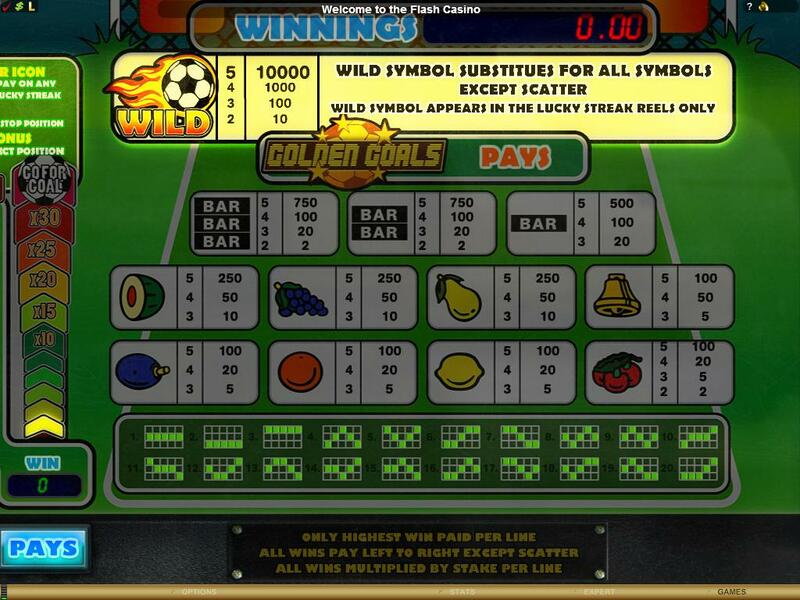 You can win it through the free spins, where a combo of wilds offers that much, or through a bonus feature called Go For Goal. The design is unusual enough, though it sports the usual 5 reels, which are surrounded by sections of info related to the features which can be activated. The football connection is mostly visible in those areas, one example being the Go For Goal section where you have a football field on which you play a bonus feature. The regular reels get mostly fruit symbols on them, and they’re not even that original or well designed. Symbols: Flaming Ball (wild, 10,000 coins), Three Bar (750 coins), Two Bar (750 coins), One Bar (500 coins), Melon (250 coins), Grape (250 coins), Pear (250 coins), Golden Bell (100 coins), Plum (100 coins), Orange (100 coins), Lemon (100 coins) and Cherries (100 coins). The football theme isn’t that well covered, but the game’s special features are unusual and fun enough that you’re probably going to enjoy it anyway. Make sure you do have enough luck on your side, the game is big on lucky streaks. 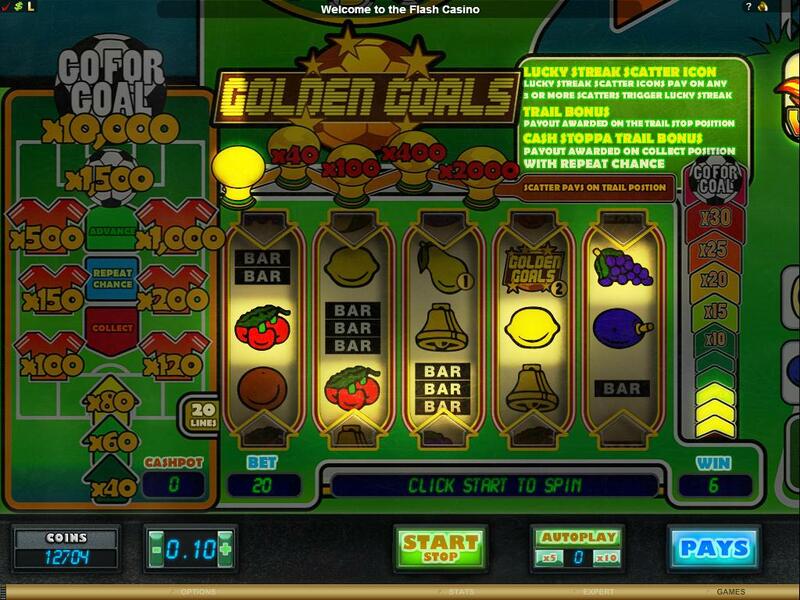 You will find Golden Goals at any online casino which chooses to use software from Microgaming, playable either for free or for real money.